Katie's passing has forced us to realize that even for the very few who are rescued, farm animals are cheated; cheated the full, natural and healthy lives that should be a given. We've so fundamentally altered these animals that they just barely survive to "slaughter weight". They suffer chronic pain, lingering fear and trauma and die painful deaths, far too young. 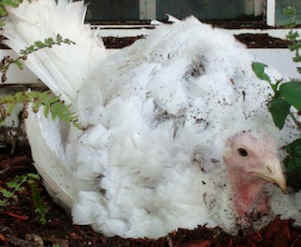 Katie was a domestic turkey, hatched in a hatchery with no mother to comfort or peep to her. When she was still a young poult, the ends of her toes were microwaved or chopped off to the extent that standing became difficult. 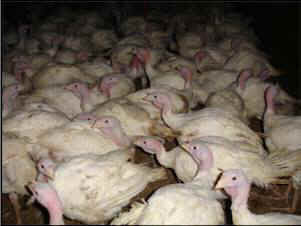 Katie existed in a windowless, dark, dirty, overcrowded shed, tormented by flies and parasites for 3 months until she reached the size of a 'young turkey' - the specific weight category the slaughterhouse she was born to be killed at was reached. Katie was in fact still a baby - blue-eyed and peeping, still calling out for her mother. The crew of young men hired to catch her and her barn- mates arrived early morning while she was still asleep. We captured with our video cameras the boys roughly grabbing and carrying the birds by one leg. The birds were then slammed into transport crates. In the chaos, Katie managed to escape; stumbling around confused and terrified. Katie had never before seen grass or trees but instinctively knew to seek cover so hid in a ditch of bushes. Unbeknownst to us, there she stayed through the night - alone, cold and terrified. 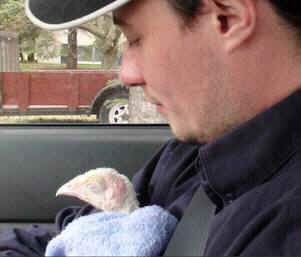 The next morning we received a call: "There's a turkey in the ditch. Do you want it?" 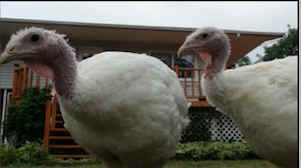 When we arrived we first saw a different turkey - smaller and much weaker. She was easily picked up and held. We named her Sophie. Then we saw Katie - terrified and near shock. I held her in my arms, covered her eyes with a towel and sat quietly, warming her. While first resistant, and very likely remembering those rough hands from the day before, she eventually calmed down and dozed off. That fear of hands stuck with Katie for weeks after the day of catching. She had clearly bonded with us - she would follow us, stare into our faces and search our eyes, and even hug us in the way turkeys do (wrapping her long neck against ours), but if we tried to pet her, she would shrink away. Katie and Sophie became fast friends with Katie as the protector of the smaller Sophie (although they were very likely the same age, Sophie was strikingly smaller). Katie led the conversations she and Sophie would have daily. Katie would start with an inquiring "PEEP?" and Sophie would respond with a down-toned, reassuring "PEEP." This conversation was repeated endlessly throughout the day. Katie also sought out the best sites for grasshoppers, then loudly announced them to Sophie with a series of staccato "POP's" that sounded surprisingly like popcorn popping. When Katie would spot a potential predator she'd stand tall and still, with one eye fixed on the threat and yell to Sophie in an increasingly high "WEE!" followed by a flat- toned "WOOO". Katie grew shockingly quickly. Within weeks walking became a challenge and she developed a limp in her right leg. Then, even breathing and controlling her body temperature became difficult. Because turkeys have been so selectively bred for maximum growth in minimum time, her skeletal and cardiovascular systems were struggling to support her massive body. We knew her time with us would be short so we made the most out of every day together. Katie spent long hours hunting insects, dust-bathing, cuddling with us and looking out for her sister. Then, on one of our morning visits to the barn, we found Katie dead. She was just 7 months old, her baby eyes were just beginning to change colour. They were going to be a beautiful amber. Now Sophie is alone; her talking has ceased - our best efforts at mimicking Katie a sad sham. Sophie has become an adult, her eyes have changed to a stunning crystal brown and she's had her first egg, but it's clear that she misses her sister terribly. Katie's passing has forced us to realize that even for the very few who are rescued, farm animals are cheated; cheated the full, natural and healthy lives that should be a given. We've so fundamentally altered these animals that they just barely survive to "slaughter weight". They suffer chronic pain, lingering fear and trauma and die painful deaths far too young. Please remember Katie and Sophie when planning your family's holiday dinners. Remember that given the chance, that turkey would've searched your face for kindness and comfort and hugged you. Please don't be a part of their continued suffering.